The smoke has subsided and the black stains of ink warfare are being attended to. Inktober 2017 brought many things, including a small army of peculiar tree-people portraits! My "Uncanny Forest" drawings are now available as prints on INPRNT! There are 30 of these bad boys with just a small taste of the selection below. Get 'em by December 25 before they vanish into the mist. Originals are also available, so feel free to contact me about those! "Jovian Fantasy" was created for the Parallel show with Light Grey Art Lab--a great motivation factor. Write it down: project deadlines, gallery shows, local networking events, conventions, and any events that might be beneficial, even if you're on the fence on whether to go or not. Studies show that writing things down can make you 42% more likely to do it. For me, the likelihood is even higher (~90%) since I make it part of my routine. I use a white board calendar, which I find faster to manipulate than a digital calendar. With that said, you should use whatever calendar is most effective for you. First, I would suggest writing down your larger goals and events for the year (big conventions may require multiple months of preparation). Next, use the first day or last day of the month to lay out the smaller goals and events for the month. For month-long illustrations, I will subdivide my deadlines to include deadlines for thumbnails, revised thumbnails, finished painting, and coloring. Just remember to check your calendar, which will free your mind to focus on creating great art! Start recording your hours when working on a project. If you have never done it, be consistent and record every project. I use Toggl, a free time tracking program that lets you label time slots and creates a monthly overview of how you allocate your time. You can record time separately for thumbnail sketching and for the final execution of an illustration, which will give you a better sense of what to charge clients. When I make a quote, I like to find a balance between my hourly rate and standard illustration pricing. It may surprise you how long your illustration takes and that knowledge is important in planning future projects. You can also use that knowledge to negotiate with clients who are unfamiliar with the often time-intensive processes in illustration. Submitting your art can include art competitions, online communities, gallery submissions, and art annual submissions. There are a bunch of art challenges out there, so focus on ones that really resonate with you. Always read the fine print for art contests, especially ones that utilize the winning artwork for a product or for advertisement purposes. A red flag would be if the winning entrants lose all rights to their work without appropriate compensation. It's more my personal stance on business ethics, but the question I ask before entering a contest is, "Is the artwork for this contest for a product that an art director typically hires an artist for?" If the answer is "yes", I don't enter the contest. The super secret tip to entering all these things is to join mailing lists. They will straight up email you the deadlines! It's madness! Many art and small business gatherings are education-focused. Mingle among those who can share their more advanced techniques and freelance insight! There's nothing quite like bouncing ideas off of people and getting a healthy dose of art critique too. You will start developing valuable relationships with people who will encourage you and check in on your progress. I stress local events as great sources of motivation since you will make more frequent and often deeper connections with people than at distant events. Look to Facebook, your local newspaper, and coffee shop pin boards for local events! What helps motivate you? Share with us your best fire-igniters in the comments! Now that you're waiting for employment, what are you going to do with all that time on your hands? This is a good problem to have. You can stay proactive with your job search and still be invested in your personal projects. Post-graduation, my personal projects spanned a gamut of themes and narratives. Some pieces were developed for contests and others were just for fun. All were valuable in providing artistic growth, but they lacked memorability. If you want to be a commercial artist, memorability is essential to standing out among an ocean of highly-skilled fishes. Think of your favorite artist (or any "famous" artist) and you will find that they occupy a certain niche. They are not limited to one subject or medium, but they make a lot of one thing: Monet's lily pads, Mucha's swirly-haired women, Keane's big eyes, the list goes on. Once that clicked for me, I realized the potential that a series of related pieces has. A series is far more memorable, especially if your stand-alone art typically runs the gamut like mine does. Furthermore, a series gives you more exciting monetization options: art books and zines, collectible card decks, postcard packs, and more! You can start fairly small with a series. One of my more successful series is just three pieces. The idea started with my Monocle Mantis illustration, which achieved a fair amount of memorability on its own. I enjoyed the painting enough to create three more anthropomorphic insect humanoids. The enjoyment factor is huge because a series can burn you out otherwise. 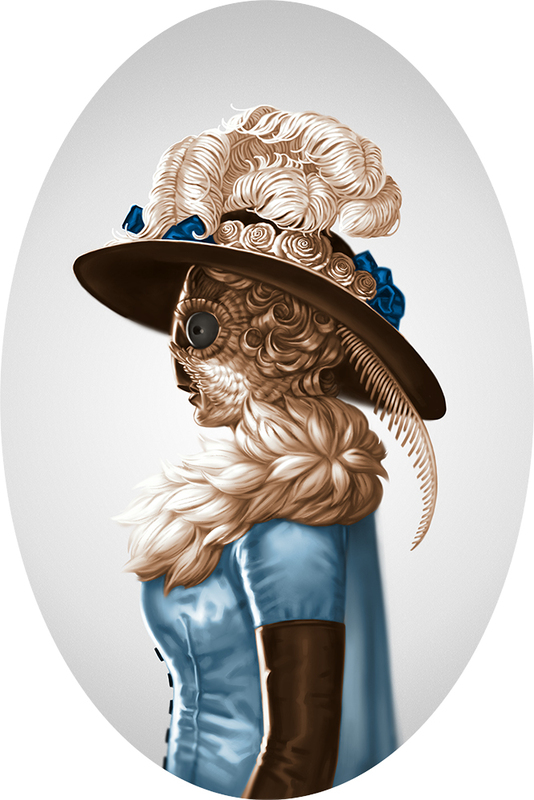 My Gentlebugs combined my love of insects and victorian fashion. The steampunk aesthetic doesn't hurt either, which made the artwork more marketable at conventions and art shows. If you are having trouble finding where to start, look at your sketchbook first. If your sketchbook is lacking, you can look at your existing body of work and see what content pops up most frequently. This is also the point to decide what the end-product will be. Think of the application for your series and how you might need to format your artwork accordingly. Next, set yourself a deadline and get started! "Patience" from my Virtues series. It bears repeating: patience is a virtue. One piece of wisdom I received from an illustrator mentor was that it would take about 5 years to establish a freelance art business after graduating from college. I thought, ambitiously, it would take me less time--maybe 2-3 years. Since I had graduate school under my belt and some experience with private art commissions, I thought I would start gaining clients. As long as I maintained my website, social media presence, and regular submissions to art annuals, I thought I was on the path to success. Rarely does life go according to plan. It took me about 2 years to find a day job. By "day job", I mean an hourly position that pays the bills as I develop my freelance illustration career. At this point, my personal/freelance artwork does not provide a source of income. I wanted to beat the 5-year trajectory for establishing a freelance business. I went into a master's program believing it would be a fast pass to employment, but such is not the case. For me, building a freelance career boils down to employment experience. I dove straight into graduate school from undergrad and put my priority on academics, portfolio-building, and school-related activities. I ended up with a Master's degree, but my ability to find employment was far from mastery. This is especially true for walk-in applications.You have a far greater chance getting a temporary position locally than on job board websites where your application could get lost among the thousands that apply. Seriously, I got two commissions out of sending a thank-you letter with an envelope that had a little illustration on it. More importantly, interviewers are people too. While it is important to submit a carefully crafted cover letter, look for applications that only require emailed portfolio submissions or a "One-Click" application. If you have a solid portfolio, you will find more success with those applications since the position will depend more on your ability than on your job experience, which you simply don't have if you are like me. Also, these applications are super fast. Once you have an account set up (and filled out), websites like Linkedin and Ziprecruiter often have one-click apply options. Of course, make sure to read all of the application guidelines to see if a cover letter or resume is required for a given job. Think of a day job as your first step toward a freelance career. There are plenty of artists who quit their day job and lead successful freelance careers. This is reasonable for those who have been working their day job for at least 3-5 years and have a decent following for their art outside of their day job. I would not advise this for recent graduates. I think any job experience is good job experience. For me, a handful of part-time jobs and being currently employed with a day-job is bringing me closer to my goal of a self-supporting art career. I'm learning valuable skills that can transfer to running my own business when the time comes. What was your post-graduate employment experience like? How long did it take you to find a long-term position or are you still searching? Feel free to leave a comment below!